Today we wrap up our theme for September: Back to School. Because life is ever-changing, we are faced with a priorities test on a regular basis. The trouble is, many times we don’t even realize it. We carry on, dealing with situations as they come. That is, until something of significance happens that forces us to reevaluate our priorities. These are tests. It could be a car accident, an unexpected death, or a serious health issue like cancer. GOD PROVIDED A SIMPLE BLUEPRINT FOR PRIORITIES: LOVE HIM ABOVE ALL ELSE, SEEKING HIS KINGDOM FIRST & ALL ELSE FALLS INTO PLACE. By all means, I’m still a work in progress. I don’t claim to have my life in perfect balance. But I have learned a few things that have brought me some peace and better balance of priorities. In order to get our lives and priorities in balance, we must first take a look at where we are spending our time. This shouldn’t be a onetime event. I have gotten in the habit of reevaluating my life priorities on a yearly basis. If something of significance, like a major change, such as an illness occurs, I may reevaluate sooner. What Does your life say about your priorities? Do you really know what your priorities are? Another thing I have found effective is to ask a family member or close friend to list what they believe are your top priorities. Once you’ve answered the three questions from Rick Warren and gotten the list back from your family member/friend, it’s time to evaluate. If things are not in proper balance, the first place to start is prayer. The key to having this rich and satisfying life is to keep God in His rightful place in our priorities. God said to Abraham, “Walk and live habitually before Me and be perfect” (Genesis 17:1 AMP). When I was young in my faith, I realized that I didn’t really love God like that. I was so ashamed. Aren’t Christians supposed to love God? I mean He sent His son to die for us. The truth was, I didn’t have enough of a relationship with God to love Him with all my heart, soul, mind and strength. I didn’t really know God. How do you love someone that you don’t really know? For me, it started with obedience. I realized God wanted me to read the Bible, and I figured that was the best way to get to know Him. So, I made God’s word and prayer my top priority. Guess what? My attitude about God slowly began to change. What started as an act of obedience, over time turned into a love relationship. Today I can tell you that I truly love the Lord! I also love the Bible! It is amazing. It contains wisdom, comfort, inspiration, encouragement for every conceivable human problem or issue. God’s Word brings peace and stability to our spirits and will renew our minds (Romans 12:2). When we make a decision to put God as our first priority and in the center of our lives, we must remember that too, is a process. Yes, we will have many tests and trials in the school of life. But we are not alone! God’s greatest desire is a love relationship with you. Will you choose to make Him the center of your life today? I NEED YOUR FEEDBACK! If this was helpful or if you have something to share with other readers, please add to the comments section below this post where it says, Leave A Reply. Takeaway and Application: Getting our priorities in order is not a onetime thing. Situations in life may warrant a reevaluation. Begin with prayer (see below).Take the priorities test above and evaluate any necessary changes. Make spending time with God in His word, prayer and worship your first priority. Prayer: Father God, I truly want to make You first in my life. I know that the other areas in my life will fall into place as I seek You and Your ways first. Please guide me as I seek to spend time with You everyday. Keep my heart and mind open to how I should apply Your word to my life. Help me be habitual in my walk with You like Abraham. As I seek to obey You, help me to learn how to love You and be loved by You. Then I will be able to love others the way You call me too. So right, Beckie! 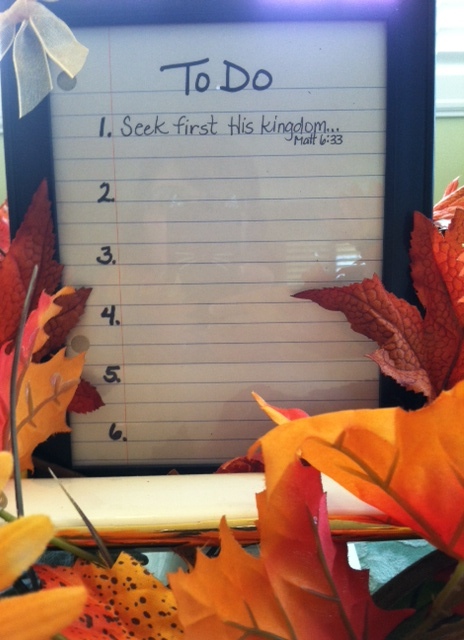 Seek first God’s kingdom and His righteousness and all these things shall be added to you. When we put God first, it’s amazing how things fall into place. Beckie, my appreciation, joy and take-away from all you write grows with each reading. I personally think that any additions or deletions would be detrimental and perhaps anticlimactic. You are exhibiting beautifully His gift to you, and the relationship you’ve asked for, and have received. Don’t doubt these things you share. He will correct as needed. Your love for Him, and for others, you should feel flowing back to you. Be encouraged by us, as we are by you and the life you live. Ron, What a beautiful thing to write. You have the gift of encouragement, my friend. May God bless you in your writing as well. I look forward to seeing “An Almost Perfect Marriage” in print so that many can benefit from it the way I have. Jean, Yes, it’s eye opening to find out what others who are close to us say we display as priorities.Thanks for your comment. Beckie, what a beautiful post. I agree, we must continue to strive to put God first. It’s a habit we can easily withdraw from with this world’s distractions. He is so faithful to hold us whenever we go to Him, why would we not want that 24/7?